Putting a face behind those who risk it all in exchange for a new life. 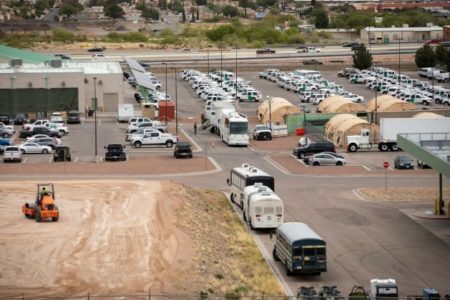 Caravans of migrants have been organized for over a decade now. 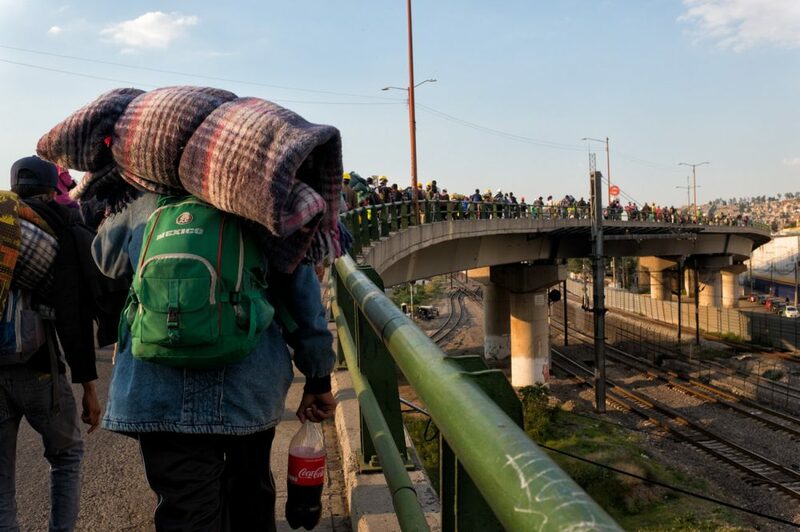 However, it wasn’t until 2014 that people came together and organized a migrant caravan from the border of Guatemala and Mexico to the U.S.-Mexico border. Besides banding together to migrate in a much safer way, these caravans are mostly driven by a common theme or goal, whether as assistance to those affected by the earthquakes in Oaxaca and Mexico City or in solidarity with those already traversing the country abroad freight trains in search of a new life in the U.S. or Mexico. 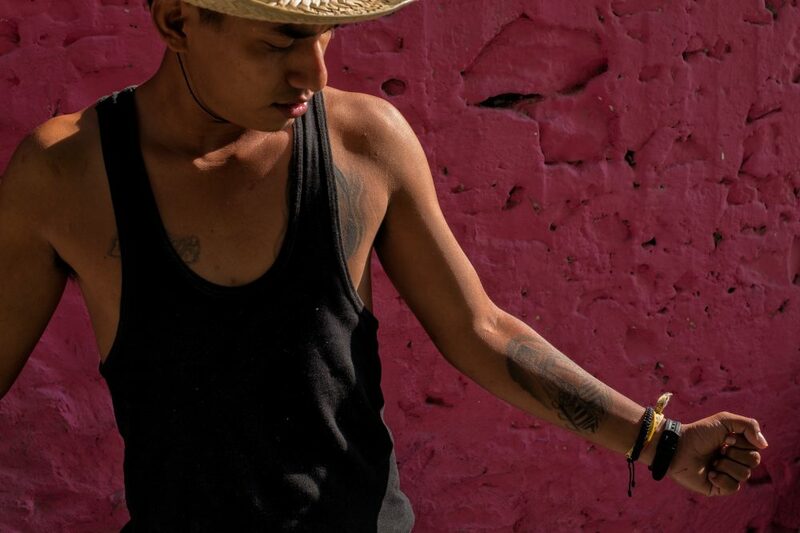 The current caravan, the Refugee Caravan 2018, was joined in April of this year by “Diversidad Sin Fronteras,” Diversity without Borders, the second trans-gay-migrant caravan, which celebrates inclusivity and diversity among migrants. At the time of writing, the group had already reached over 1,500 travelers. Photographer Verónica G. Cárdenas has been documenting their journey. 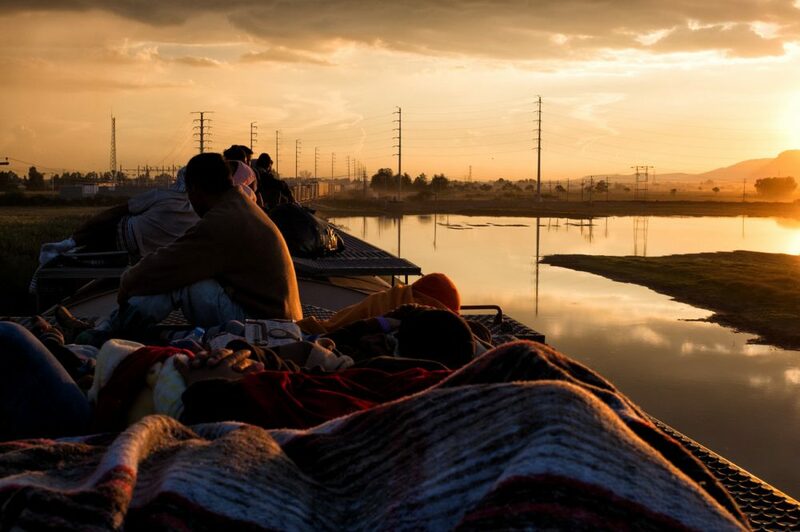 We spoke with her about the significance of this caravan of migrants, her reasons for wanting to tell the story of the journey and the people who go through it, and how the land has shaped who she is as a Mexican-American photographer now. View from the train on its way to Guanajuato, Mexico, Oct. 22, 2017. Andrea, 14, brushes her hair. 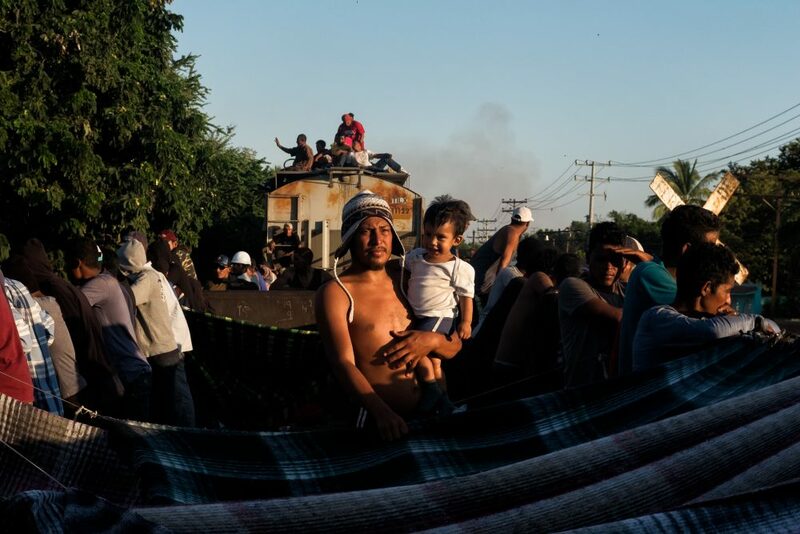 A man living across the railroad tracks offered up his house for people in the caravan to shower or wash their hair while the train stopped briefly. Mazatlán, Oct. 23, 2017. 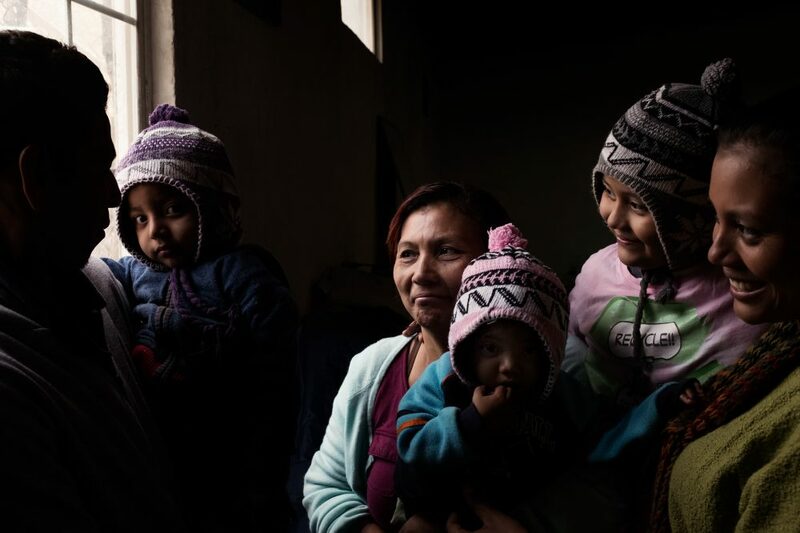 Could you tell us about the reasons behind your coverage of the caravan? 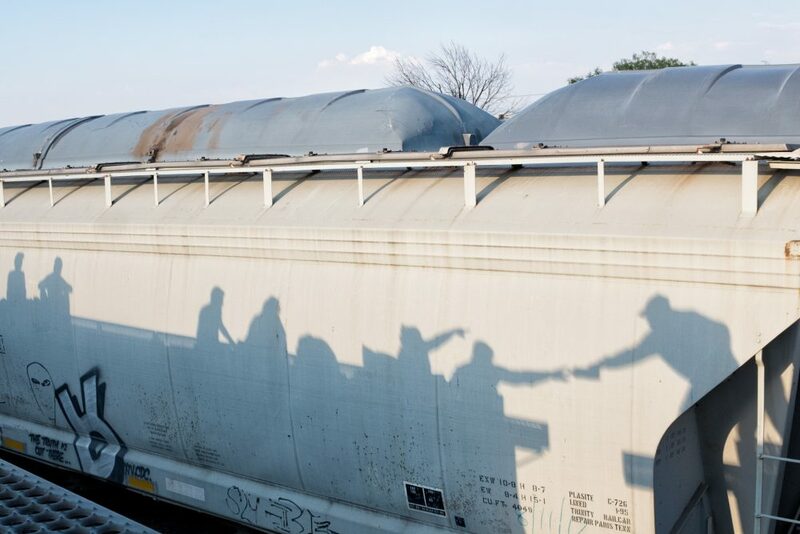 I had always heard stories about people traveling on “La Bestia,” The Beast, which are the freight trains that some migrants take in order to traverse Mexico. I heard stories of migrants losing a limb, being kidnapped, raped, killed or robbed on those trains. 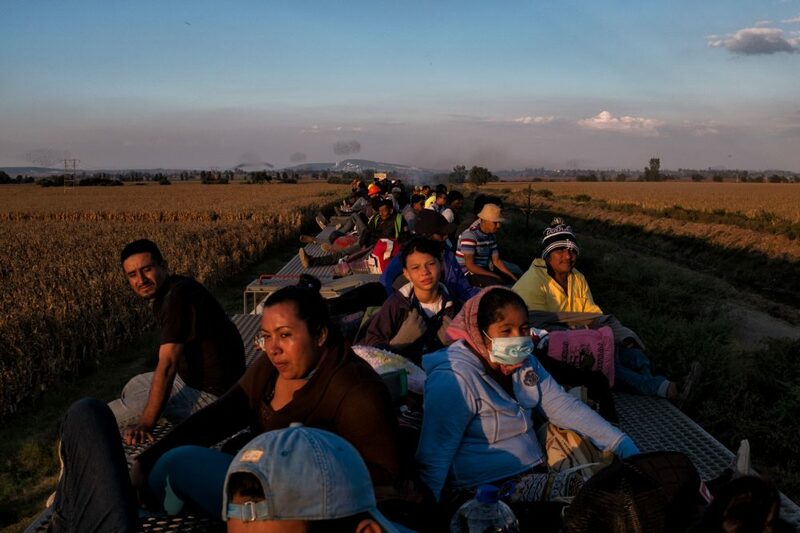 Every year it becomes more dangerous for migrants to traverse Mexico, particularly on the freight trains. A friend who was one of the volunteer lawyers screening the cases of those in the 2017 refugee caravan told me about the caravans. Once I realized how much safer it was to travel with them, I decided to join them. What do you want to communicate through your work? I want to convey what it’s like for people to travel on these caravans. I’d like to show that indeed, it is a tiresome and dangerous journey, but along the way, life goes on — some daily routines do not stop happening because they’re traversing. I also want to portray them in a more dignified way where they are not solely victims of violence or lack of opportunities in their countries. This is a work in progress and I hope to do this movement justice. We tend to talk about numbers when we speak of immigration, but I want to show the people behind the numbers. 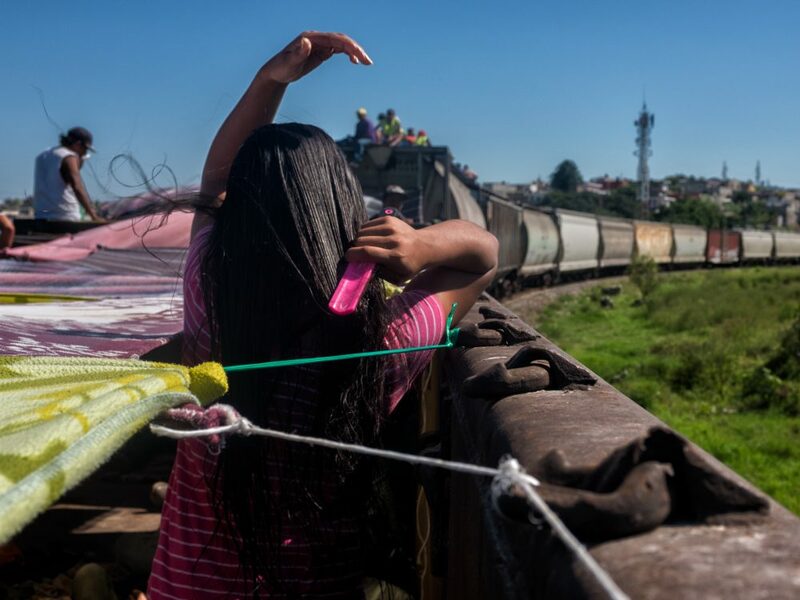 I want to show how Andrea continues with her daily life aboard La Bestia, brushing her hair as if she was in her room back home or how triumphant they all feel just hours before seeking asylum. 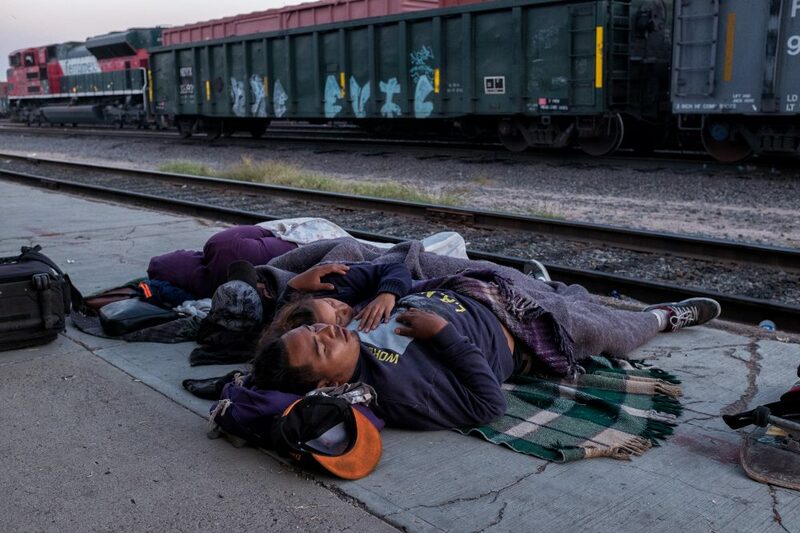 Refugee caravan members sleep near the railroad tracks in Sonora. On April 9, 2017, a group of Central Americans from Guatemala, El Salvador, Honduras and Nicaragua joined to form the 2017 Refugee Caravan, or Viacrucis 2017, put together by organizations from Mexico and the U.S.
Víctor (from left), Steven, María, Sofía, Alison and Evelyn pose for a photo in a shelter in Tijuana before they turned themselves in at the San Ysidro Port of Entry, May 6, 2017. Eighty percent of the women and girls who cross Mexico to get to the U.S. border are raped on the way. The situation is so common that most of them take contraceptive precautions as they begin the journey north. How has it been to be a woman photographer working with women under such circumstances? The caravan offers major protection against such dangers, although migrants are still at danger on the road. They can still get robbed, kidnapped, or raped. I did not come across a woman or girl that had been raped during the journey. Because there were so many of us together all the time, I noticed it was difficult for a person to open up without having someone else listen to their story. Some women did share how they had been victims of domestic violence, gang threats, and in some cases, a family member had been killed and they now are fleeing for their lives. 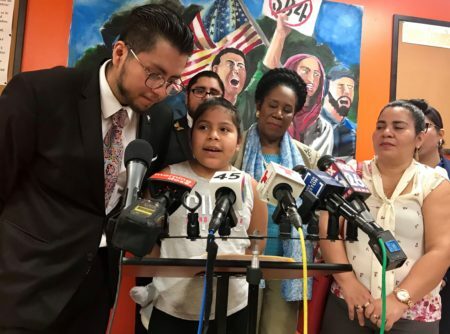 Members of the last large LGBTQ group who joined Diversidad Sin Fronteras and the Refugee Caravan 2018 get ready to seek asylum at the San Ysidro Port of Entry on May 9. Migrants aboard La Bestia (The Beast) traveling to the U.S. in search of asylum, Oct. 22, 2017. Estela, 30, shaves her legs at a church in Mazatlán after traveling for three days on a freight train, Oct. 24, 2017. What is the nature of your relationship between you and the people and/or the places you photograph? 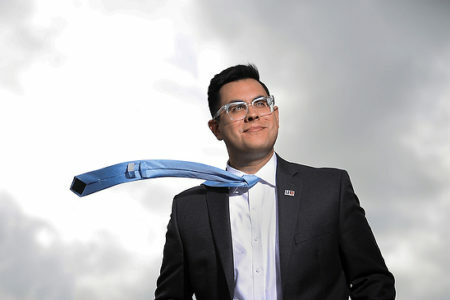 I was born in Mexico, but now I am a U.S. citizen and I live in McAllen, Texas, which is part of the Rio Grande Valley. 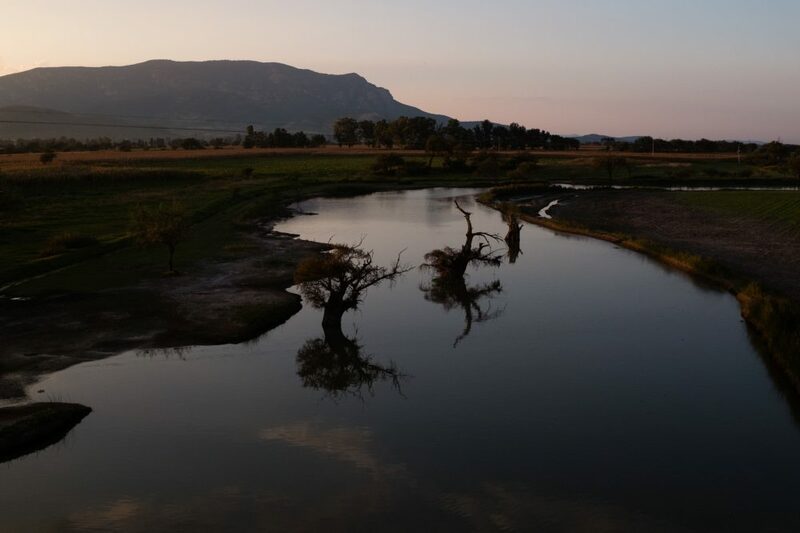 For years I have been surrounded by migration issues whether I am affected by them or not. I am at a privileged position and perhaps I did not go through what migrants in the caravans go through, but I seek to do my part as a journalist and as an immigrant in this country to share their stories. I live in the Rio Grande Valley, the valley, the place that has shaped who I am. 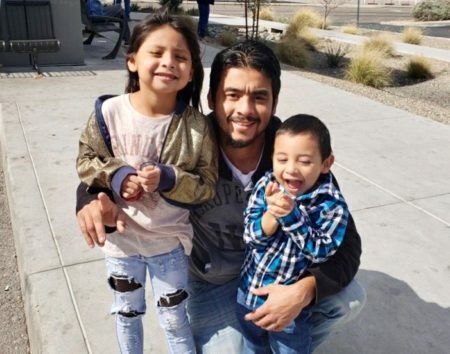 For years I struggled with identity, I did not feel I belonged in the U.S., but then going back to Mexico started feeling less and less like home. I was from neither here nor there. I later realized that the valley, geographically speaking, represented who I am. Now I feel like I am in between Mexico and the U.S. Living here has helped me understand other aspects of my personal life, that it is OK to feel that you are always somewhere in between. 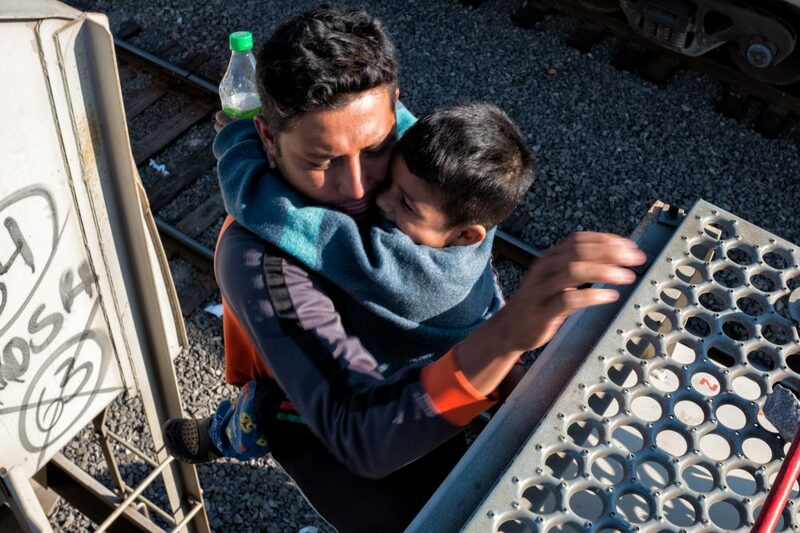 José gets off La Bestia with his son Andrée while the train stops on its way to Tijuana, Mexico, Oct. 22, 2017. Men bring back snacks from a nearby convenience store for the women and children while the train is stopped, near Guanajuato, Oct. 22, 2017. This tattoo is a reminder of Israel’s first journey aboard La Bestia as an unaccompanied minor in 2011, when he was 16 years old. Mexico City, Oct. 19, 2017. Members of the refugee caravan on their way to the station in Mexico where they will be boarding the freight train. Mexico City, Oct. 22, 2017. How has this story changed your photographic practice? Covering the caravans has helped me better understand their struggle as they make their way to the U.S. I learned that I am even more patient when it comes to taking a photo. After all, I am an implant to the situation. I like for them to get used to me, generally speaking, before I take a photo, otherwise I feel like I am stealing from them. Any other thoughts you’d like to share? Even when I have only joined the caravans for a week each time, it is impossible not to form strong bonds with the people. At the end, you are exposing yourself to nearly the same dangers as they are, but there is a major difference: They are there because they are forced to migrate, and I am there by choice. Migrants on their way to Guanajuato, Oct. 22, 2017.